It just so happened that shortly after dipping my toes in the water of highly convenient grocery delivery with Peapod, I received a couple of snail mail coupons from Fresh Direct, a similar service that delivers in the Northeast U.S. With two coupons for $50 off an order of $125, and free delivery (okay, actually delivery for one cent), I couldn’t waste any time checking out my second grocery delivery service. $125 is right around my average spending on groceries for the week (probably excluding the weekend), so I didn’t have to spend beyond what I normally would to get the discount. I buy a lot of produce, and when tallying up my grocery spending for this week, the promo essentially equated to getting all my veggies FREE. I will most definitely take that. The promo code is “SAVE2017”. Feel free to give it a try before February 17–it will likely still work! Check out the post about Peapod for more about how I’m planning for deliveries and meals. 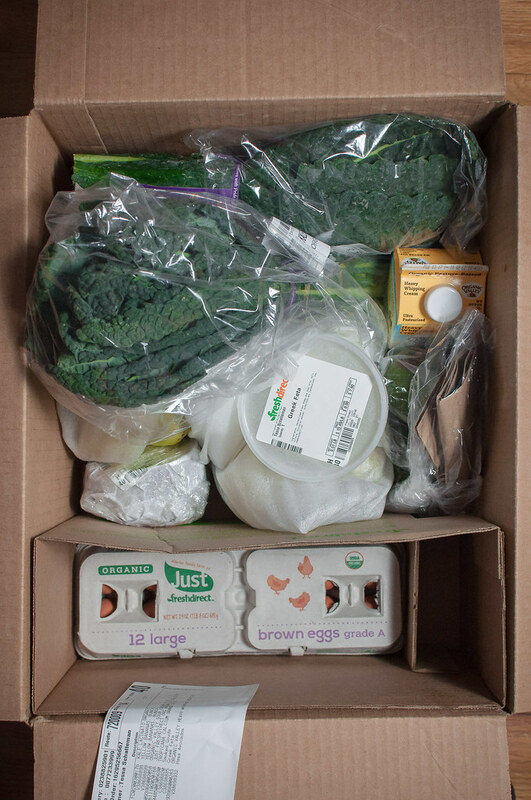 I’ll post the meal plan I used for the Fresh Direct order in a day or two, but for now here are my general thoughts on Fresh Direct delivery service. If you saw my most recent recipe post, you heard a little bit about the delivery scheduling saga. My chosen delivery window was on Sunday night between 4 and 6 PM. It was a little snowy and slick outside, but at 5:30 I got a text that my order had been delivered. It wasn’t anywhere in sight on our property, and Steve even checked our neighbors’ houses without finding the delivery. I gave it another hour, considering the weather conditions, then called customer service around 6:30 PM. The woman I spoke to was friendly and promptly got in touch with the driver, who “went back to check where he left it.” What??? At this point I was thinking he just picked any old house on our street without even looking at the address, but within 15 minutes we did have our groceries on the front step in great shape. I’m going to chalk this one up to the dark, snowy conditions, and based on the customer service I received, it won’t stop me from placing my next order with Fresh Direct. 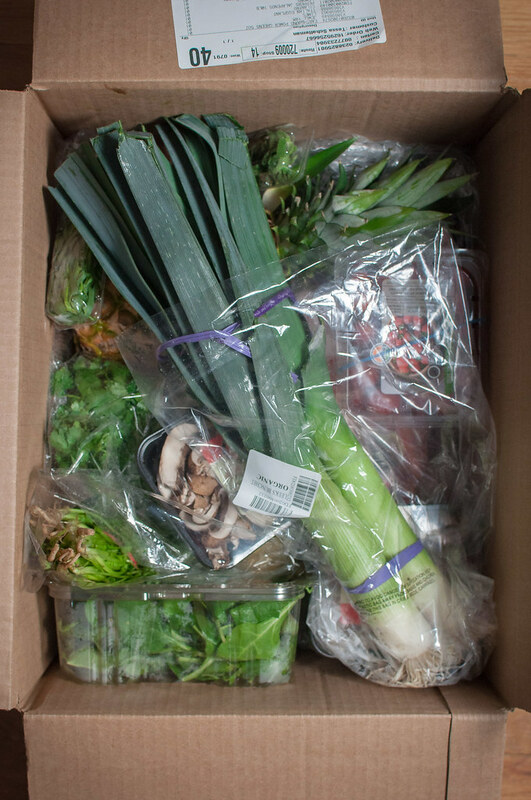 Better than the flimsy plastic grocery bags used to deliver groceries from Peapod, the Fresh Direct order came in three boxes. The improvement stops there, though, because the boxes weren’t necessarily packed for maximum efficiency (the one with pantry items could have been packaged in a much smaller box), and almost every produce item was separately wrapped in another piece of foam or plastic. When I grocery shop I barely put any produce in plastic bags, opting to just toss it in my cart then into the bags. Between the two services, Peapod with flimsy bags and Fresh Direct with excess packaging, it’s pretty much a draw of environmentally unfriendliness. Pricing is high on some items. For example, a bunch of two large leeks was $4.99, probably a bit more than I would have paid in store (or at the farmers market). Hemp milk (again! ), cacao powder, and whole canned artichoke hearts in water were the items on my list that I couldn’t find. Again, I had to make a quick supplementary grocery run during the week, but I’ll expect that with any grocery delivery service at this point in their evolution. Much of the produce is priced per pound, so if you have a somewhat photographic memory, it’s easy to quickly assess the price compared to in-store shopping. With that said, you still order based on quantity, and you’ll see on screen how many pounds you’re expected to get. Prices are adjusted on your final bill to reflect the actual weight delivered. It might seem a little confusing, but I find the pricing more fair than ordering per piece (like with Peapod) and it’s just as easy regardless of whether your goal is to shop by weight or piece. My only accompanying complaint is when you order a specific quantity of items that come in much smaller than expected. For example, I ordered three “large” red onions which turned out to be fairly small. I anticipated this when ordering and ordered an extra, since it’s a pantry item that keeps well and isn’t super expensive. For more speciality produce items, though, it could be detrimental to your planning. When ordering produce, the item screen tells you how long your item is guaranteed fresh. This is crucial when you’re not able to specify expiration dates on, say, packaged greens. The dates I was given held true: my produce has lasted all week, longer than most of the estimates. There’s a virtual “cheese shop” with lots of variety and the ability to order in quarter pound increments. You can use grocery delivery and still put together a classy cheese plate! The overall variety and product offerings are mind blowing. I browsed some of the fresh juice and prepared food products, and if you have a large grocery budget or are craving something specific, you could have some serious fun on this site. Fresh Direct also carries most of my preferred brands for pantry items like grains, beans, and tomato products. They even deliver booze! Items out of stock are marked as such when you order. Unlike Peapod, there are no surprise missing items when your delivery arrives (hopefully), and you’re able to look for substitutes while still placing your order. In most areas, a minimum $40 order comes with a delivery fee of $7. Not bad, especially if the dollar amount of your order is much higher. However, Fresh Direct offers a “delivery pass”, which, if you place four orders per month, comes out to under $3 per order. It’s still worth it at even two deliveries a month, and if you order twice a week, delivery is practically free (can you tell I’m a former accountant???). If I stick with Fresh Direct I’ll definitely be converting my trial delivery pass to the real deal. 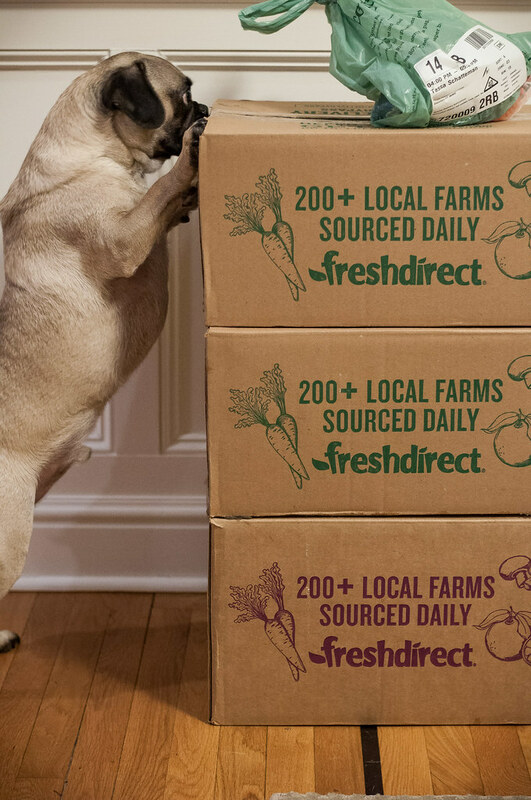 Between Peapod and Fresh Direct, I have to say I’m going to be loyal to Fresh Direct at this point. Despite somewhat higher prices, especially on produce and dairy, I do much of my in-store grocery shopping at Whole Foods for the quality of the product. Fresh Direct seems, essentially, to be the online version of Whole Foods. I don’t feel great about all the prices all the time, but the convenience of getting all quality products in one place is worth a few extra dollars to me. 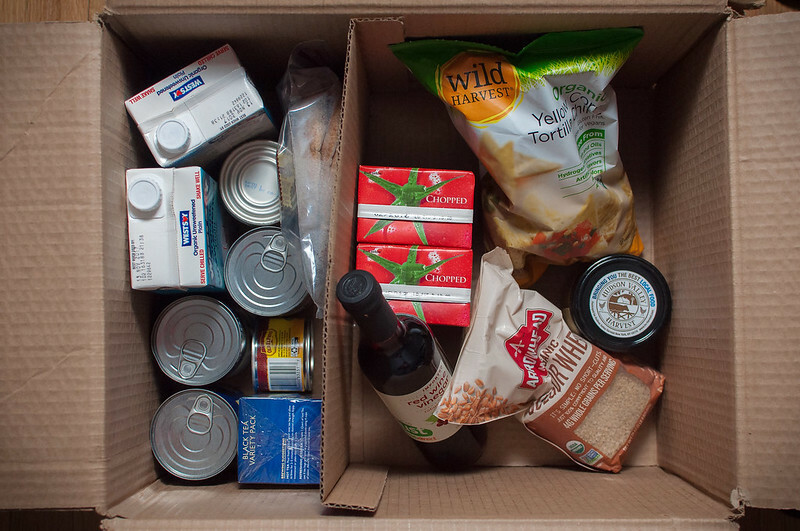 Online grocery shopping has been totally convenient, and while I’ll likely stick with it, I didn’t anticipate the disconnectedness it would create between me and my food, even more so than a chain grocer does. At least in store, I can pick up an apple and see where it came from (generally), but if that feature is offered online, the region is often more broad and I get so busy price checking that I don’t even realize my bell peppers are coming from Europe. It takes most of the seasonality out of cooking when you can choose from two pages of fresh tomatoes smack in the middle of January. Grocery shopping online also saves me trips to the store. Where I used to visit Trader Joe’s or Whole Foods every couple days, shopping online necessitates meal planning, and I feel much more on top of what we’re eating throughout the week. The last two weeks, I’ve planned dinner for every weeknight, I have plenty of leftovers for lunch, and I’m even stashing some extras in the freezer as I realize I have enough ingredients to double certain recipes. All that from one online order and one trip to the store. 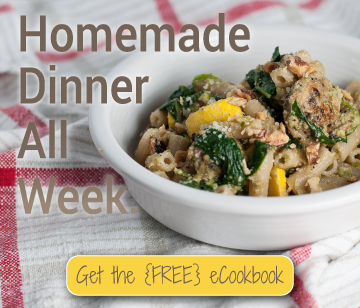 Coming shortly, I’ll share the meal plan that I made this week using my Fresh Direct delivery! I have no affiliation with either Peapod or Fresh Direct and all opinions express are (very much) my own.